In part two of this series, I’ll cover the creation of your first elastic index, CRUD operation and simple search with paging and sorting. But before that I’ll give you some more background information about Elastic. 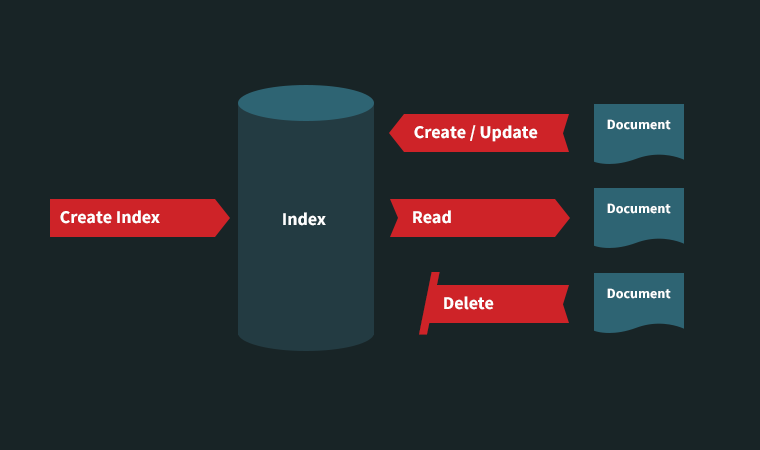 According to the same guide, "The act of storing data in Elastic is called indexing … In Elasticsearch, a document belongs to a type, and those types live inside an index.… An Elasticsearch cluster can contain multiple indices (databases), which in turn contain multiple types (tables). These types hold multiple documents (rows), and each document has multiple fields (columns)." ElasticType defines Elastic index type. Name and IdProperty option could be specified. Name – provides type name. IdProperty – specifies which property should be used as identity key. ElasticProperty specifies how model properties should be indexed. For each property, we could assign the following four options: name, type, index option and analyzer. The “Name” option specifies what that property is called in Elastic index. The “Type” option specifies how your property is stored (Elastic internal type are the following: string, integer/long, float/double, boolean and null). The “Index” option could have the following values: Analyzed - value of property will be analyzed and processed before indexing it; NotAnalyzed - value of property will not be analyzed and will be indexed as it is; No - value of property will not be indexed. You can read more about mappings here or here. Now save build and run program. You should see the following output in the console: "True." Congratulations, you just have created your first Elastic index! Body = "This is very long blog post!" Now, save your build and run the program. You should see the following output in the console: "True." When you save the document into the Elastic index, you should provide data, index name and ID. Use the “refresh” option if you need newly created data to be instantly visible in THE index. Otherwise, it will take some time before it is indexed. Please note that the value of the "ID" property in your output will be different because we used “Guid.NewGuid()” to generate it. By now, you have probably noticed that we are specifying the index name in each NEST method call. The good news is that we could avoid the specifying of an index name by providing a default index and then setting up a connection. Let’s update our code in order to provide a default index, as follows. That wraps up the CROD operations section. Now, we move on to searching. We’ll start by populating our index with new documents. The following code snippet will create ten blog posts. They are almost identical, except one number in the title and body. This number represents the index in order of document creation. You saw simple query (“match all”) in action we will now look into other query types. That's it for part two of this series. In part three, we'll cover other types of queries, such as Match, Bool and Nested Types. Stay tuned!